Medina Glass fabrication shop gives it an advantage | Medina Glass Co. When it comes to needing storefront windows, doors, custom aluminum work, and anything else needed for a commercial customer in a hurry, Medina Glass Co. has an advantage over its competitors: A metal and glass fabrication shop. 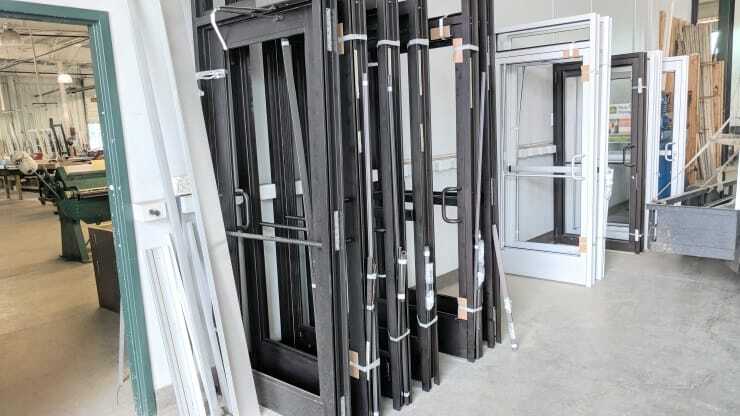 Workers manufacture an array of products, like Tubelite aluminum doors, storefront windows, and other glass-based products. The glass fabrication shop is stocked with tools needed to do the job: Saws, punch presses, milling machines, copy routers, sheet metal shears, sheet metal brakes and more. “It’s really a complete shop,” Vice President Pat Neyhart said. In addition to storefront doors and windows, the shop can handle custom aluminum sheet work — which includes things like trimming for windows, carpets, roof caps, wrap columns, and weatherproofing. Jon Harshman, who oversees the fabrication operations, said the work flow of the shop is very efficient. The way the material is stocked, the equipment laid out, and the completed products are stored (as they await transport to a job site), it minimizes how many times things need to be touched and moved. Thus, it speeds up the process from the time Medina Glass Manager Brian Keltz places a job order with Harshman until the fabrication shop crews complete it. “What customers like is we can knock out jobs in a day (at the fabrication shop),” Keltz said. “Jon (Harshman) is very knowledgeable about hardware,” Keltz said. The hardware referred by Keltz deals with the locking mechanisms and entry systems used by businesses. Frequently, specifications require keyless access. There is a lot of technology — electronics and computerization — built into the new doors. School officials, government leaders, and business executives are becoming more security-conscious, and the latest technology helps protect against unwanted access into buildings. Doors are now fabricated using magnetic locks, electric hinges, specialized “panic” hardware, security glass, and other pieces of hardware. Some of the technology uses magnetic card readers to gain entry into a business or factory, while others use a keypad. No matter what kind of hardware is required, Keltz said Harshman and his group can handle it. Because Medina Glass can fabricate storefronts, doors, and more to a customer’s specifications, it really speeds up the turnaround time to complete the order, Neyhart said. If a car were to crash into a storefront, because the fabrication shop is a licensed Tubelite fabricator, they can get working on a replacement right away instead of having to wait for the door or windows to be shipped in. Visit Medina Glass online at medinaglass.com. You can reach us at 330-725-4605 or through our Contact page.